At about 1.30am on 16 June, a group of 50 to 60 people stormed the Kremikovtsi area of Garmen, a Roma residential area of the village in south west Bulgaria, near the border with Greece. According to the police, the group was carrying “hard objects”. According to a legal observer, they were armed with clubs, hammers and chains. For over an hour the attackers ran amok around the neighbourhood, smashing Roma property and assaulting any Roma person who dared leave the safety of their home. The police sat back and watched – not one person was arrested. This is not an isolated event. Since 23 May the Roma community in Garman has been besieged by groups of Bulgarian locals, joined by members of Ataka, a Nazi organisation. For nearly a month there have been nightly anti-Roma marches and the roads leading into the neighborhood have been blocked by racists. On 2 June, around 500 thugs marched around the village attacking Roma people and their property. A biker gang joined the attack. The violence against the Roma is spreading. At the beginning of June the government demanded that 120 Roma residents who lived in Lozenets in Stara Zagora, in central Bulgaria, take down their buildings. On 10 June, the police moved into the district tearing down any property that remained. Those families were forced to pay the cost of demolishing their homes. Crowds of locals cheered as the buildings were pulled down. Since Sunday there have been daily anti-Roma marches in Sofia’s Orlandovtsi neighbourhood. Seven Roma have been seriously injured and over 70 people have been arrested in the past two days. Fascists and racist thugs are clearly behind the attacks. 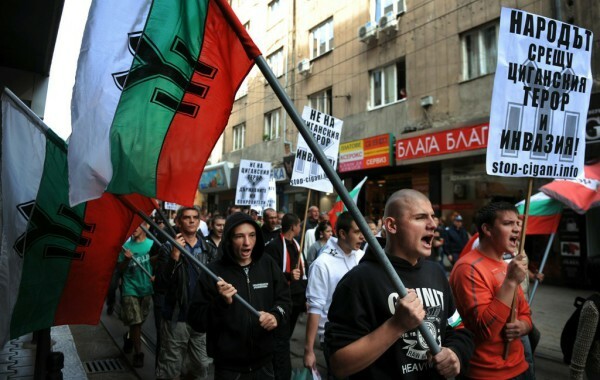 Fascists are on the rise in Bulgaria, and now hold one in eight seats in the country’s parliament. But it is successive Bulgarian governments that have created the conditions leading to the violence against the Roma. They have done little to improve the economic misery many Roma face and have encouraged anti-Roma racism. Roma account for about half a million of Bulgaria’s population of 7.5 million. They are an oppressed people. One in three lives below the poverty line. Half the Roma population live in housing that lacks basic amenities such as running water and electricity. Only 15% of Roma children have secondary education and over a quarter of Roma pupils are taught in segregated classrooms. We are now witnessing the sickening spectacle of Roma communities in Bulgaria being forced to live in ghettos surrounded by walls. This is also happening to Roma in other Eastern European states. Economic and social discrimination against the Roma is widespread across Eastern Europe and attacks are widespread. Jobbik, Hungary’s Nazi party has built its political base organising violent protests against the Roma. Discrimination against Roma in relation to housing provisions means that Roma families live in substandard housing conditions with inadequate infrastructure, lack of legal security of tenure and were subject to forced evictions, amounting to a violation of the right of the family to social, legal and economic protection. Segregation of Roma communities in Bulgaria is common, we submit that large numbers of Roma live in settlements, often physically walled-off from the non-Roma population and excluded from mainstream social and economic life. Bulgaria is the EU’s poorest country. A Bulgarian National Statistical Institute survey, released on 15 December 2014, found that over a fifth of the total population lives below the country’s poverty line. Unemployment levels have reached 47% and almost half the population cannot afford to heat their homes. This level of poverty is creating high levels of bitterness. And the government and media constantly blame the Roma for everything from crime to benefit fraud. Combine that with widescale fascist agitation against the Roma and the situation is explosive. The situation for the Roma in Bulgaria is dire. Tragically it looks set to get worse.